Did you know that I have now been blogging for one year, two months and twenty-three days and for all this time this quick and easy to digest list remains the most popular blog post I have ever written?! People love small bites of information. They are easy to digest, help you have a sparking conversation and give you a sense of instant gratification, like you have learned something valuable and clever fast without investing too much brain effort. Perfect for our reduced attention spans! On the other hand, such lists can be a joy to write. And as I have been invested in some rather heavy introspective writing these past few days, I just needed a quick and easy way to remind myself of the joys of putting pen to paper (or fingertips to a keyboard, if I have to be precise). Otherwise, I was running the risk of simply not updating the blog for a very long time until I was completely happy with the current piece I am working on – namely the second part of this blog post. Such lists also give me the opportunity to store on paper (digital, in this case) all the little facts of life I pick every day as I get to know Italy on a more personal level. Some of these nuggets of knowledge are so out of this world that I don’t want to forget them. In constant need of mental capacity though, I have to store them somewhere safe instead of simply forgetting them. A joy to write and (I hope) to read, bursting at the seams with juicy information about the beautiful country I currently call home and which exerts an undeniable gravitational pull over a large portion of the population of Earth. Read on and let me know which of these facts you enjoyed the most. 1. 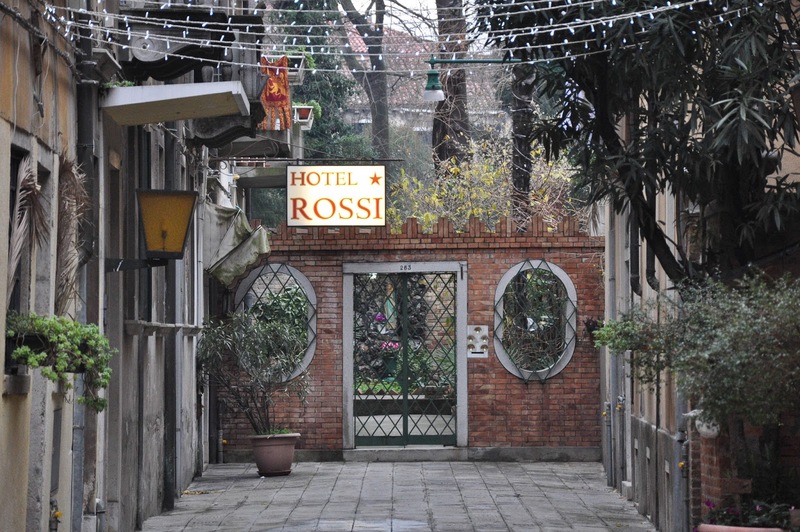 The most popular Italian surname is ‘Rossi’. A bit awkward as this is actually my Christian name. Cue long explanations when I meet Italian people for the first time and a few stifled laughs and/or incredulous stares. 2. Italy is the world’s leader in kiwi fruit production. Yes, it has almost double the land dedicated to kiwi fruit cultivation than New Zealand. 3. Italian women don’t change their surname when they get married. According to the 1975 Maiden Name Law, if they wish, they can only add their husband’s name to their own maiden name after they get hitched, but not replace one with the other. 4. In 16th century Venice the ladies of the night were allowed to stand on their balconies and windows half naked to attract their clientele. Apparently this was in order to beat off the stiff competition coming from the ranks of the scandalous drag queens who would criss-cross the streets hidden behind a cat- or pig-shaped mask and attract a lot of business. 5. All around Italy you can find some weird and wonderful vending machines selling stuff like raw milk, bunches of flowers and even pumpkins and watermelons. Not to mention condoms, mozzarella, twenty types of coffee and ice. 6. Factory-produced sliced packed bread in Italy is sprayed with ethyl alcohol as a preservative. Apparently, some of it evaporates when you open the pack and the rest evaporates when you toast the bread. So, don’t be surprised if a whiff of alcohol hits you as soon as you open the plastic bag. Personally, I stick to the local bakery! 7. Italian firefighters have developed a special type of ladder, called (obviously) ‘Italian ladder’ (scale italiane), which doesn’t need to lean against a wall to stay upright. It helps them tackle fires in centuries-old historical buildings and other difficult to access places and points. 8. You may have heard that the heir to the British crown – the cute little Prince George – is now attending a Montessori nursery. Did you know though that the Montessori education method was developed by an Italian lady called Maria Montessori? 9. Depictions of the Last Supper in several churches of the Italian Alps include lobsters among the plates and the cups on the table. Apparently, the dark ones are orientated towards Judas, so they are perceived to be a symbol of evil or sin. The red ones may carry a link to eternal life, as the change in colour of a crustacean when cooked is often associated with the Resurection. 10. Cremino is a delicious Italian chocolate invented in Turin in the second half of the 19th century. Nowadays, there are many different varieties of cremino, but traditionally it has three layers. The outward ones are made of gianduja (chocolate with 30% ground hazelnuts) and the one in the middle is coffee-flavoured chocolate paste. 11. Porticos are roofed porches supported by columns on one side and the facade of a building on the other. In layman’s terms they are like covered pavements – very useful when it rains, as you can walk the whole length of a street without getting wet. Most Italian cities and towns have splendid porticos with mighty columns and beautifully frescoed ceilings and walls but they are all surpassed by Bologna with its 40 km of combined length of painted porticos. 12. At train and tram stations in Italy you can often find big old-fashioned scales to check your weight. After all that gelato, pizza and a myriad of other Italian delights, this is a scary prospect. 13. Allegedly, Mussolini decreed that a persimmon tree should be planted by every Italian farmhouse. This was because the persimmon fruit is unusually high in calories (127 calories per 100 grams as opposite to 52 calories per 100 grams of apple, for example), so it was perceived as a high-energy food for soldiers. 14. Italian buildings are adorned with faces carved out of stone (see pictures here). Look up and you will see a pair of stone eyes staring down at you. Often these faces are scary or grotesque with their tongues sticking out, eyes lolling and/or disfigured features. Other times, they are quite attractive, especially the female ones. Apparently, they were originally used to ward off evil spirits. 15. Zebra crossings in Italy are not marked by flashing lights as it is the custom in the UK. Also, cars often are parked right by their edges making it very difficult to spot the oncoming traffic. Every time I need to cross, I have to crane my neck round the long line of parked cars and see if anyone is coming. If there is an oncoming car, then I need to wait to make sure that it will actually deign to stop and let me pass. In about 45% of all cases (strictly based on personal experience), it doesn’t. 16. A whole leg of prosciutto (with the bone) weighs between 9 and 11 kg. If the bone is removed, then the prosciutto is sewn up and its weight can be anything from 6.6 to 8.2 kg a piece. 17. Names which for most of us are strictly connected to a literary or art setting, are used as everyday names and surnames in Italy. Only today, I passed by a house in Vicenza and the name on its bell was ‘Signore Otello‘. 18. The world’s largest astronomical clock is to be found in the city of violins – Cremona – in the Northern Italian region of Lombardy. It was constructed in the late 1500’s and it is very beautiful. The twelve zodiacal signs are represented in gold on a blue dial and apart from indicating the time, the clock also displays astronomical information, such as the relative position of the sun, moon and zodiacal constellations. 19. Cremona’s astronomical clock (see point 18 above) is embedded in the bell tower of the city’s cathedral. Standing at 112.7 m height it is the third tallest brickwork bell tower in the world and the oldest brickwork structure over 100 m which is still standing. 20. There are over 70 free water fountains dotted around Venice. This may not sound like a big deal, until you have had to pay 3 euros for a small bottle of mineral water in the city on a scorching summer day. Instead, procure one of these fountains which are strategically placed in squares around town and drink the free flowing cold water to your heart’s content. 21. Carbs go very well with carbs in Italy. You haven’t lived until you have tried the local potato rosemary focaccia. There is something so satisfying tucking into one with the chewy texture of the focaccia contrasting with the mushy softness of the potatoes, whilst the sprigs of rosemary provide a burst of flavour. 22. The Natural History Museum in Venice has among its exhibits the double heads of two Siamese antelopes. 23. The Italian Elena Cornaro Piscopia (born in Venice in 1646) was the first woman in the world to receive a University doctoral degree. She also spoke several languages, was a skillful musician and composer, excelled at mathematics and astronomy whilst her main field of expertise was philosophy and theology. 24. Often Italian homes don’t have enough space for a washing machine to be installed in the kitchen. So, you can customarily find it in the bathroom right next to the (also customary) three-quarters length bath. Failing that, the washing machine can also be installed in the garage, as it happened in our case. 25. Marostica – a picturesque walled town in the Northern Italian region of Veneto – has been known for its cherries since the 15th centuries. It is the only place in Italy to obtain the Protected Geographical Indication (PGI) mark specifically for cherries. The juicy red fruits there grow to a staggering 3 cm in diameter a piece! I will post the second part of this list in the next couple of days, so keep an eye on the blog and my Facebook page. Ta!